(Nanowerk News) The quest for potentially habitable planets is often interpreted as the search for an Earth twin. And yet, some rocky planets outside our Solar System may in fact be more promising candidates for further research. Scientists from KU Leuven, Belgium, have run 165 climate simulations for exoplanets that permanently face their 'sun' with the same side. They discovered that two of the three possible climates are potentially habitable ("Connecting the dots – II. 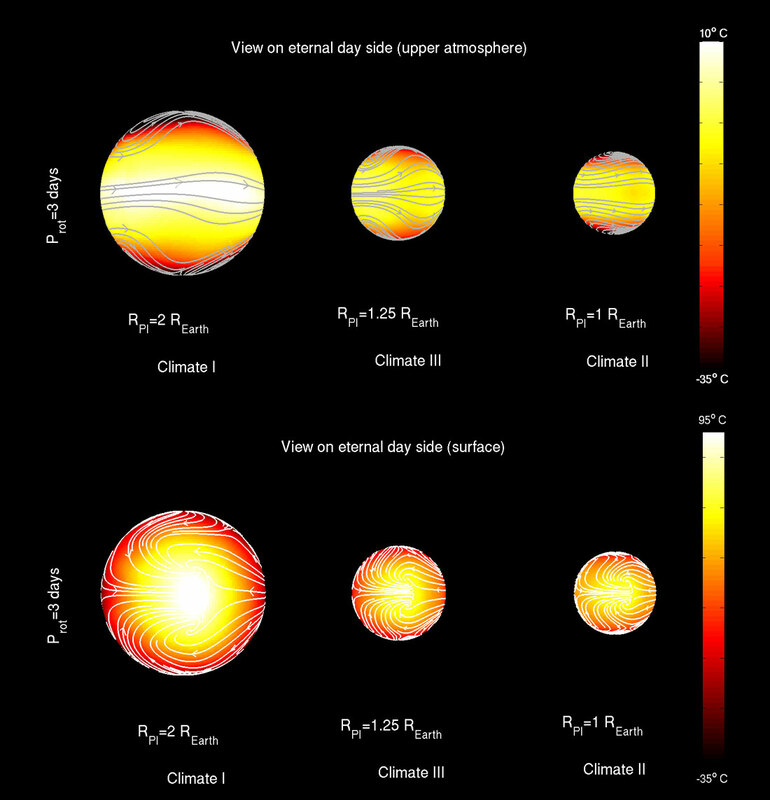 Phase changes in the climate dynamics of tidally locked terrestrial exoplanets"). Most exoplanets orbit relatively small and cool stars known as red dwarfs. Only exoplanets that orbit close to their star can be warm enough for liquid water. What is more, being close to their star also makes these potentially habitable planets relatively easy to detect and observe for research purposes. Many exoplanets that orbit closely to their stars always face that star with the same side. As a result, they have permanent day and night sides. And yet, the climate on these planets is not necessarily scorching hot on one side and freezing on the other. This is due to a very efficient 'air conditioning system' that keeps surface temperatures within the habitable range. Dr. Ludmila Carone, Professor Rony Keppens, and Professor Leen Decin from KU Leuven, Belgium, have now examined the possible climates of these exoplanets in unprecedented detail. "On the basis of 3D models, we examined exoplanets with different rotation periods and sizes," Ludmila Carone explains. "We discovered that these rocky planets have three possible climates, two of which are potentially habitable." On exoplanets with rotation periods under 12 days, an eastward wind jet known as superrotation forms in the upper layers of the atmosphere along the equator. This wind jet interferes with the atmospheric circulation on the planet, so that its day side becomes too hot to be habitable. A second possible wind system is characterised by two weaker westward wind jets at high latitudes. The third climate option combines weak superrotation with two high-latitude wind jets. These last two wind systems do not interfere with the 'air conditioning system', so that the planets remain potentially habitable. The findings provide valuable input for future space missions. Specifically, KU Leuven researchers are currently involved in the preparation of the James Webb Space Telescope mission (2018) - the Hubble successor - as well as the planet-finder mission PLATO (2024). Not only will the study help identify the most promising candidates for further research in our solar vicinity, it will also help avoid the premature discarding of potentially habitable planets that are worth investigating despite their 'un-Earth-like' appearance.